The Met Hadley Office in the UK recently announced that global temperatures will this year exceed one degree Celsius of warming above pre-industrial levels for the first time. The significance of this landmark cannot be understated. In the words of some of Australia's leadingpublic health experts, "Beyond two degrees of warming, health impacts threaten to become increasingly unmanageable". There couldn't be a greater urgency for action to protect health and wellbeing from the devastating effects of climate change. The prestigious medical journal The Lancet has described climate change as "the greatest health threat of the 21st century". The evidence is irrefutable “ climate change poses unprecedented risks to human health and wellbeing. Taking strong action to protect our land, our water, our food and our communities is critical to protecting health and wellbeing of Australians and people around the globe. In the "land of drought and flooding plains", we are all too frequently reminded of the vulnerability of human health and wellbeing to the wrath of nature. Climate change in Australia is likely to contribute to increased deaths and injuries, particularly among children and the elderly, related to worsening heat waves and other extreme weather events. We are not unfamiliar with the fury of heatwaves, such as that which killed 374 Victorians in a single week of January 2009. As weather patterns change, we will face increased water scarcity and food insecurity from drought and floods. Climatic changes to date mean rainfall across south-eastern Australia is likely to decrease by up to 15% before 2030, regardless of whether greenhouse gas emissions are reduced. As temperatures rise and rainfall patterns change, there will be a spread of food, water, and mosquito-borne infectious diseases in Australia. By 2050, there will be between 205,000 and 335,000 new cases of bacterial gastroenteritis in Australia each year, and up to 870,000 cases by 2100. An additional 335,000 cases could result in $92.3 million in health and surveillance costs and 1.6 million lost workdays Those of us working in health services will be at the frontline of responding to this increased burden of disease. The increased demand on health and emergency services during extreme weather events is difficult to calculate, as extreme weather can aggravate pre-existing illness. However, the 2014 heatwaves in Victoria contributed to 203 heat-related deaths, a 20-fold increase in the number of ambulance call-outs, a four-fold increase in calls to nurses-on call and a four-fold increase in calls to locum doctors. The cost associated with damage to hospitals and health infrastructure from extreme weather events is likely to be immense. Indeed repairs to health facilities subsequent to the2011 Queensland floods cost taxpayers $18.1 million. The implications of climate change on the social, economic and environmental determinants of mental health cannot be ignored. In Australia, it has been estimated that the relative risk of suicide can increase by up to 15 percent for rural males aged 30-49 as the severity of drought increases. Climate change is a disease amplifier, and will exacerbate many of the health inequities that plague Australia today. Australia is fortunate to have more resilience to the challenges of a changing climate than many less-developed nations. However our island girt by sea will not be untouched by the suffering of others. As our neighbours in the Pacific Islands are threatened by rising sea levels, Australia will have to determine how to respond to an influx of climate refugees. The combined challenges of food an water insecurity and mass displacement are likely to pose significant national security threats. Tackling climate change will dramatically improve human health. For example, particulate air pollution contributes to the deaths of up to 2,400 Australians every year “ more than the annual road toll. Indeed, pollution from coal combustion and motor-vehicles in Australia is estimated to carry health impact costs of $2.6 and $2.7 billion respectively per annum (see here and here). A move away from fossil-fuel combustion thus has resounding benefits for reducing the burden of disease in Australia. Action to prevent catastrophic climate change is no longer a question of technological or economic capability. Australia is well placed to achieve 100 percent of energy generation from renewable energy by 2050, and could do so without incurring massive adjustment costs or depressing economic growth. Transitioning to a renewable energy economy will drastically reduce the burden of respiratory disease, and provide tens of thousands of sustainable jobs in regional areas. Ensuring the efficiency and resilience of our agriculture systems will safeguard the access of all Australians to high quality, nutritious foods. Revolutionising our urban spaces to make them more bike and pedestrian friendly will drastically cut the burden of non-communicable diseases. Sincere commitments to greening our hospitals and healthcare systems, will minimize waste, maximize efficiency and enable our limited healthcare budget to be spent supporting our valuable workforce in their contributions to the community. The impetus for action is clear. The longer it takes for our government to commit to strong action to mitigate climate change, the larger the burden of disease in the community will be. As health professionals we have a duty to advocate for the health and wellbeing of our patients. Ours is a respected and valued voice in the community; the voice of evidence-based insight and of demonstrated compassion. A sincere commitment to the protect health and wellbeing of Australians requires a genuine, urgent effort to tackle climate change. As world leaders convene in Paris for the 21st Conference of Parties on the United Nations Framework Convention on Climate Change, communities around the world are mobilising in an unprecedented demonstration of the support for action on climate change. Around the world, the health and science sectors will join the People's Climate Marches to send a resounding message to decision makers that we are firmly committed the pursuit of a healthier future. 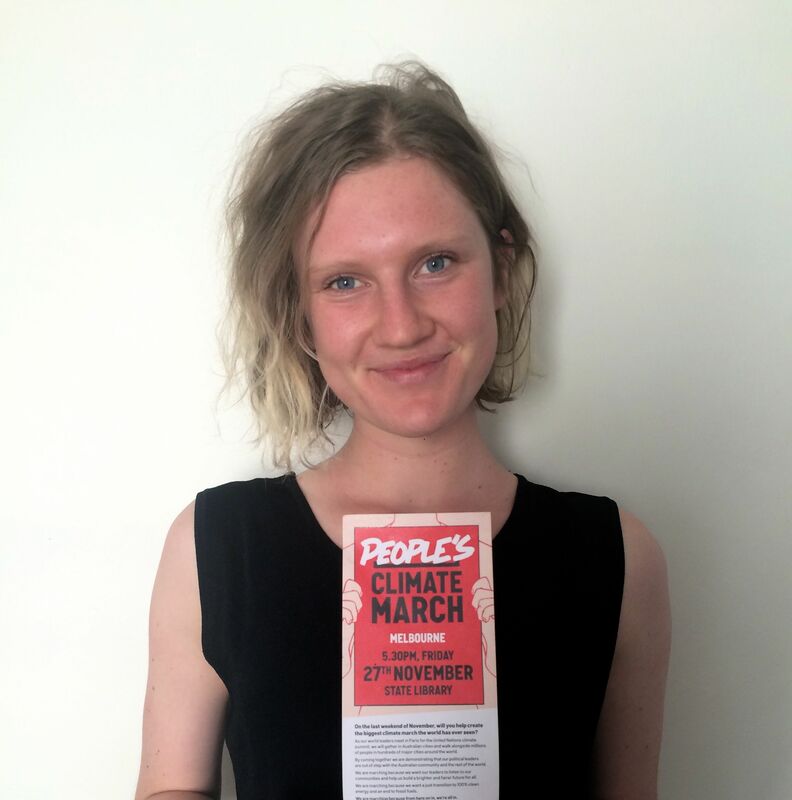 Join us in Australia by RSVPing to peoplesclimate.org/#health, and joining your local march in the color white. ¢ Grace FitzGerald is a medical student at Monash University, and in 2015 co-project managed the Australian Medical Students' Association Code Green project. A "climate octopus", Grace has worked in a volunteer capacity with the Australian Youth Climate Coalition, Doctors for the Environment Australia, the Climate and Health Alliance, Healthy Futures and 350.org. Grace has been on the Victorian Organising Committee engaging the health sector in the People's Climate Marches.